This post is part of a series that explores questions that a good business analyst will ask. This is Question 4 of 8. What is my Vision for the Project? When a Business Analyst discusses vision he’s looking for the right blend of process, strategy and goal. For the Business Analyst there are two key tools that are used to capture the vision. Please be aware that Vision is more than putting together a diagram and showing it to a client. The client must approve the Context Diagram and the Case Diagram. Vision uses context diagrams and case models. A Context Diagram provides the overall look of the project. 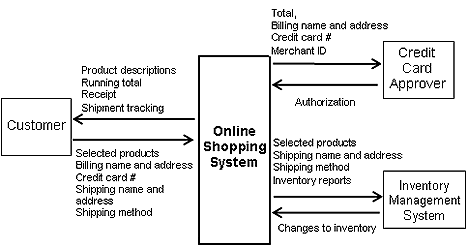 Look at the diagram and you’ll notice that at the center is the Online Shopping System. Boundaries are then exacted from the center. When you’re addressing stakeholders this visual is a must. This is to ensure all the gaps have been properly filled. A Context Diagram shows the working parts. A Case Model shows how the working parts are used. Notice how easy it is to follow the customer as he begins his interaction. 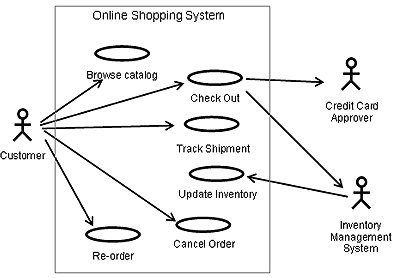 Notice too, how the system interacts with customer for inventory purposes. This is a perfect example how Business Analysts should be aware of the influence of technology. Efficiency for the company does not always mean efficiency for the customer. The two must be balanced. Images provided courtesy by http://www.butrain.com/BusinessAnalyst/definescope.asp.